Attractions in Mile End, London. Our 7 day weather forecast for Mile End updated throughout the day, making it ideal for planning leisure activities, travel and events. Read more about our weather forecasts. On Monday 22nd April 2019 the sun will rise at 05:50 and will set at 20:08. It's going to be quite a warm day, with temperatures reaching 23.6°C. Today is expected to be a dry day, with a very low chance of rain. It will be quite a breezy day, with a maximum expected wind speed of 11mph. On Tuesday 23rd April 2019 the sun will rise at 05:48 and will set at 20:09. It will be a mild day, with temperatures reaching around 20.9°C. Today is expected to be a dry day, with a very low chance of rain. It will be quite a breezy day, with a maximum expected wind speed of 13mph. On Wednesday 24th April 2019 the sun will rise at 05:46 and will set at 20:11. It will be a mild day, with temperatures reaching around 15.9°C. Today is expected to be a dry day, with a very low chance of rain. It will be quite a breezy day, with a maximum expected wind speed of 18mph. On Thursday 25th April 2019 the sun will rise at 05:44 and will set at 20:13. It will be a mild day, with temperatures reaching around 15.9°C. A few showers are expected, 4mm of rainfall is possible today. It could be quite a gusty day today, with a maximum expected wind speed of 26mph. On Friday 26th April 2019 the sun will rise at 05:42 and will set at 20:15. It will be a mild day, with temperatures reaching around 15.9°C. A light shower is possible, 2mm of rainfall is possible today. It could be quite a gusty day today, with a maximum expected wind speed of 28mph. On Saturday 27th April 2019 the sun will rise at 05:40 and will set at 20:16. It will be a mild day, with temperatures reaching around 13.7°C. Today is expected to be a dry day, with a very low chance of rain. It could be quite a gusty day today, with a maximum expected wind speed of 27mph. On Sunday 28th April 2019 the sun will rise at 05:38 and will set at 20:18. It will be a mild day, with temperatures reaching around 10.4°C. Today is expected to be a dry day, with a very low chance of rain. It will be quite a breezy day, with a maximum expected wind speed of 14mph. Our weather forecast for Mile End is updated throughout the day and has been found to be very reliable for planning activities such as days out, leisure, travel, events, fishing, golf and gardening. 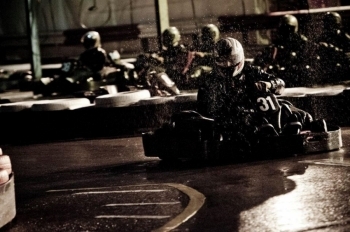 Welcome to Revolution Karting, London’s fastest Floodlit Track in the heart of London. We are centrally located just 2 stops from Liverpool Street and a 7 minute walk from Central, Hammersmith & City and District Line Station. We are an outdoor track with the fastest karts and much preferred by the majority. It is an ‘all weather’, floodlit track so racing is available around the clock, rain or shine. We cater for all occasions and all different group sizes, from large corporate events, to stag do's and even single racing at our open racing session for just £25 per person...here at Revolution Karting we offer fun and excitement all year round.